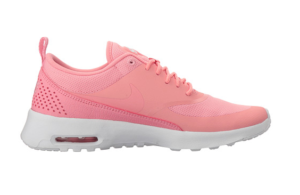 The Air Max Thea Nike women's sneaker presents a simple and sleek profile. The Thea is multifunctional; it is a sneaker for running, walking, working out or a go-to shoe at anytime and anywhere. It’s simple and clean look is also complimented by the amazingly lightweight feel. 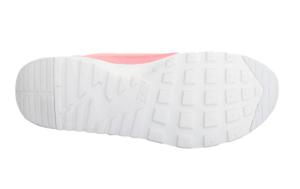 The featured Max Air technology in the heel tells you about the good cushioning and long lasting comfort it brings. 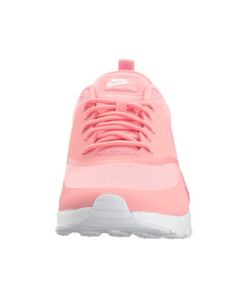 The shoe comes in nice colors to choose from. 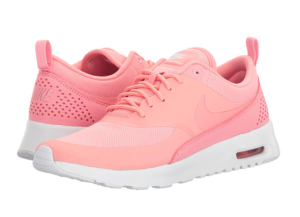 If you are also one of the wearers that live in sneakers most of the time, then this Summer you can add Air Max Thea to your list. Users on their feet all day at work find the shoe very comfy. 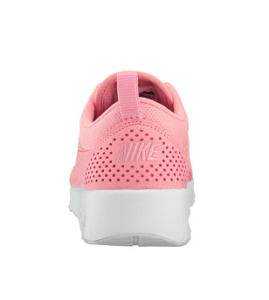 Good for multiple purposes-walking, running, working out, and casual wearing. 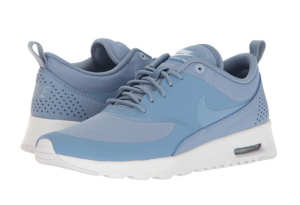 It is a light and stylish sneaker for traveling. It offers a slightly dressed-up and cute sporty look. The shoe makes bigger feet visually smaller. The style is good with casual wearing. You will notice people checking on your shoes with envy. The shoe can be too narrow for the wider feet. A couple of wearers feel the shoe is too stiff and it won’t loosen up easily. 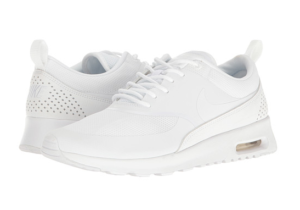 The Nike Air Max Thea stands out with its clean and sleek look. 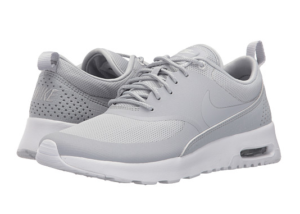 If you feel for a clean and simple shoe that also needs to be as comfy as an athletic shoe, this is it. The Thea features the well-known visible Max Air technology, which gives great support and impact protection. The shoe maintains a remarkable lightweight feel, and a impressive minimalist appeal. 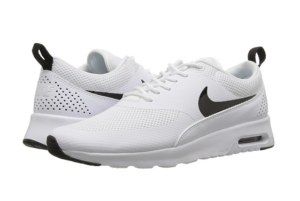 In the Summer, this is a cool and good looking go-to shoe and will fit with your casual outfits effortlessly. 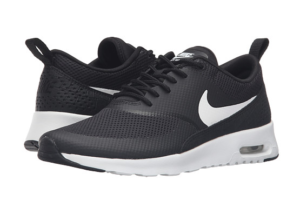 Wearers use the shoe for running, walking, or working out. 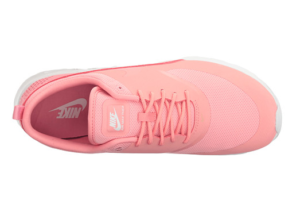 It is also the go-to shoe for going out or running errands. As many wearers have found out, it is a shoe that is good to pack for traveling. When you want to keep it simple with luggage, this sneaker can be the shoe for everything. It is comfy for walking around all day, and it looks stylish with casual clothing. Many users took this shoe for Europe when traveling and were greatly satisfied with the result. 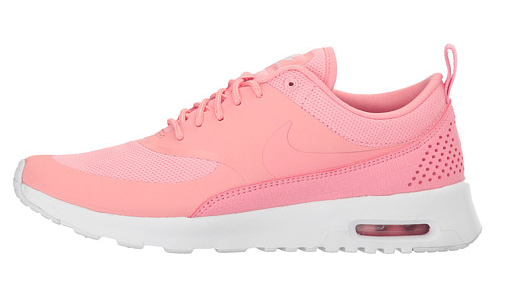 It is one of the main reasons that make some buyers who bought this shoe return to order another color. The shoe uses mesh, leather, and synthetic overlays for support and lightweight feel. The mesh at the forefoot and perforations at heel keep the feet breathable. The padded collar comes with a pull tag for easy on and off. The shoes’ visible Max Air technology gives maximum impact protection. The 1 1⁄4 in- heel gives some height while the outsole is durable and comes with good traction. impressed! Very useful info specially the remaining part 🙂 I take care of such information much.